I love marshmallow in pretty much any form so was very exciting to see two kinds of marshmallow fluff cupcakes. I had half of a container left over from Christmas fudge making and I needed to use it up, so I combined about 8 oz. of Fluff with about 3/4 c. softened butter and added powdered sugar and vanilla to taste (probably about 1/2 to 3/4 c. sugar and a 1/2 t. of vanilla) and mixed with my faithful KitchenAid stand mixer. It was good! Rich and not too sugary. But more than that, it was really fluffy and I could spread and pipe to my heart's content. I'd say it made enough to frost 18-24 cupcakes, depending on how generous you're feeling. 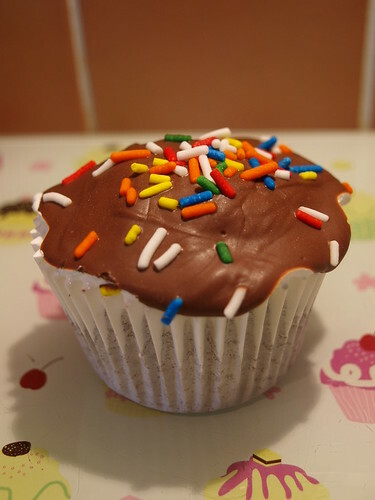 The second features chocolate marshmallow fluff cupcakes by Cupcake Corner - click through for recipe! Thanks for sharing....I made the marshmallow frosting today for my Sweet Potato Pie cupcake....it's to die for. I don't even like sweet potatoes.